This volume consists of numerous texts of the 14th and 15th centuries; they encompass a wide variety of materials, in Latin and French, prose and verse. All but the last two items were bound together by the 15th century, when they were owned by the Carmelite Convent in London. 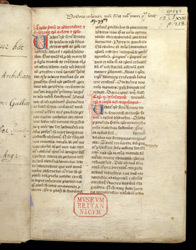 In the upper margin of the first page of the text is a note stating that the book was given to the London Carmelites by Brother Robert Yvori; below this, in darker ink, is the house's characteristic press-mark 'M. 39'.